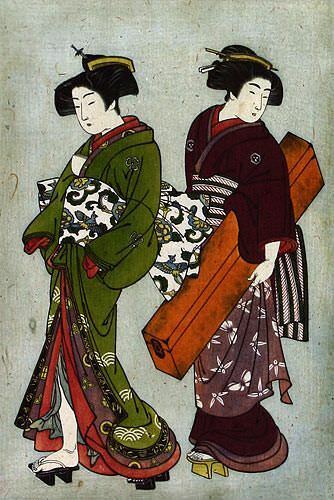 Artwork Panel: 32.5cm x 48.1cm ≈ 12¾" x 19"
Silk/Brocade: 41.8cm x 106.9cm ≈ 16½" x 42"
This depicts a geisha walking through town followed by a servant carrying a box. Both of them have their hair styled in the torobin fashion, a hairstyle popular during the end of the An’ei era. The Japanese title suggests there is a 三味線 (a 3-stringed lute called a Shamisen or Samisen) in the box the servant is carrying. They may be on the way to do a performance somewhere, or perhaps they just returned from shopping for and purchasing this special musical instrument. This was printed on some high-fiber handmade paper. It has lots of husks and fibers just like the papers from hundreds of years ago. This is a giclee print reproduction of a very old Japanese woodblock print. This was made months ago, rather than centuries ago.